Search your way through one of the seven wonders of the ancient Egyptian world and uncover the secrets of the hidden tomb. 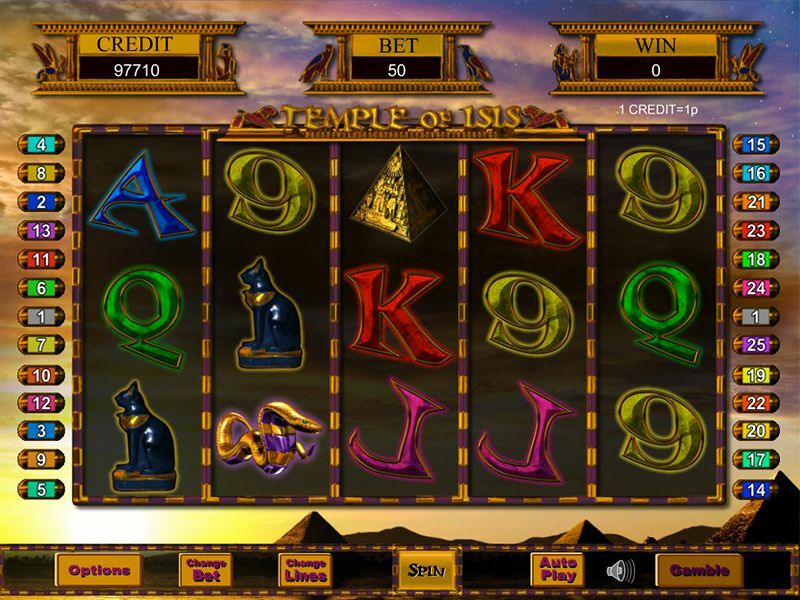 Archaeology does not need to be your forte to win big, so come play onlines slots. Eyecon has played a blinder, this is one of the most well known contemporary five reel slots games on the market. 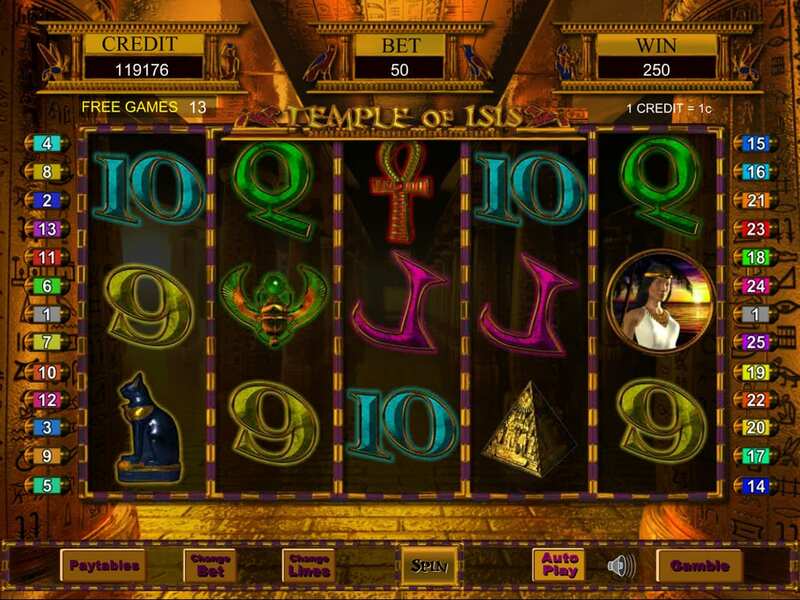 Temple of Isis has been a huge success since it hit the market proving popular across the world. The game takes the player on a trip to ancient Egypt to delve deep into the pyramids to loot ancient treasure and artifacts. Take a trip to Egypt at the time of the Pharaoh’s, as a tomb robber of the ancient pyramids, to relieve them of their hidden treasure and relics. It’s a tremendously fun and engaging game and allows you to unleash your hidden tomb raider. Eyecon have flexed their development muscles with this one and the quality of the game shines through. We love Eyecon’s slot games more and more, with every new release. The games are always extremely easy to use and very well designed. You can see more of Eyecon's games here at Wizard Slots online casino site. In this game, Eyecon has stuck to the well-proven format with a slots game of 5 reels and 25 pay lines. Keeping it simple pays dividends with the gameplay which is simple to use and very entertaining helped by the Egyptian theme and backdrops, all of which add to the sense of adventure. The Egyptian night sky is the stunning backdrop to the game adding mystery to the smell of antiquity. Be warned that the game can become very absorbing so select your budget carefully as this slots game can get quite addictive. This is proof that you're in the right place for the best slots you can play. There are some excellent staking options and you can make a minimum of bet from just one penny so it’s a superb choice for players who want to have the added flexibility in choosing their budget to enjoy the maximum amount of gameplay and gambling adventure. Ancient Egyptian symbols represent the characters on the reels of this game. There are letters, and numbers and higher value symbols in hieroglyph-like designs such as cats, serpents and huge pyramids. A superb bright and bold theme is colourful and visually stunning, and the added music brings an extra dimension to the whole theme. There are some really interesting bonus features to the game, with the Priestess Icon representing the wild symbol. The Priestess helps you to win more combinations because she replaces all of the other symbols on the reel, with the exception of the scatter symbol. If you land five of these in total you will win the jackpot. 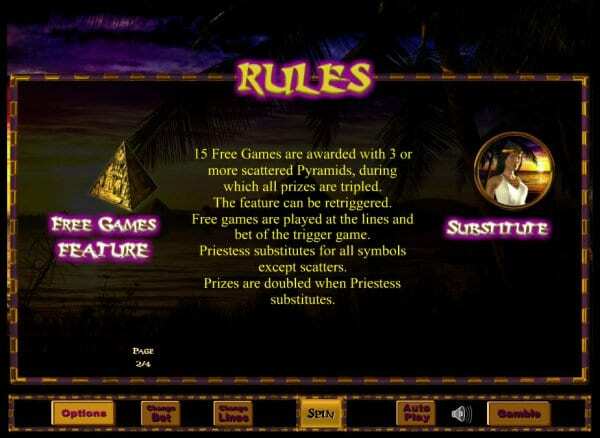 The main icon of Ancient Egypt, the Pyramid, represents the scatter symbol in the game, and if you are lucky enough to land three of these anywhere on the reels you’ll receive fifteen free spins. On top of that, all other prizes are tripled during the free games so be sure to keep a keen eye out for those scatters, as it’s a sure way to a big win.